WORTH EVERY SECOND - The most effective, empowering and negative energy removal guided meditation on achieving a deep relaxing cell rejuvenating sleep. Contains 9 Solfeggio Tones, Alpha, Beta, Theta and Delta Brainwaves. Countless positive suggestions and guidance. Release all negative physical and emotional blockages and cleanse your body at the cellular level. Awaken full of energy and feeling better than ever before. This meditation works automatically! 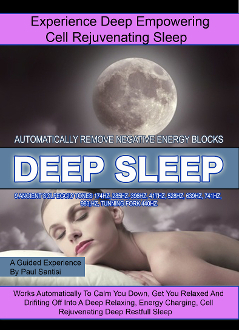 This is World Class Meditation to release inner energy blockages and sleep a deep restful cell rejuventating sleep guaranteed. Liseten with headphones on for best experience.